2 ½ hectares of well-manicured 16-year-old vines grown in structured La Motte soils (alluvial with a high percentage of decomposed plant material in the lower levels). The yield of 6 tonnes/ha. 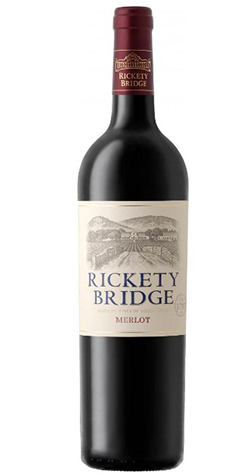 Rickety Bridge Merlot grapes were harvested by hand at 24.4˚ Balling in February 2017. Fermentation took place in open fermentation tanks at 25 – 30˚C with 4 punch downs daily. The wines were pressed after 21 days up to 0.9 bar. Malolactic fermentation took place in stainless steel tanks and maturation took place 20% new and 80% older French oak barrels for a total of 15 months. Rickety Bridge wine estate is undoubtedly one of the most progressive wineries in the Cape. The historic winemaking cellar was recently renovated and converted into a barrel fermentation centre, the new winery was built and modern cooling equipment was installed. The newly built wine tasting centre is the perfect place to sample 200 years of winemaking tradition: taste these delightful Franschhoek wines in comfort, al fresco in summer on the winery veranda or relaxing in front of the fire in winter. The pleasures of these outstanding South African wines extend beyond the bottle.